Okay gang for those who think it's odd to soak them in warm water...well the warm water is merely to dissolve the sugar. After the sugar is dissolved I add some ice and then do the soaking. 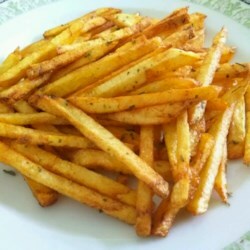 These fries are the best. I have baked these (spraying with pam & seasoning w/ garlic salt) as well as fried them and they are always a hit. Thanks Lorelei!